If you follow me on Social Media like Instagram or Twitter, you might have noticed that the hubby and I celebrated our anniversary this past weekend. Seventeen years to be exact. Yes, I know! Crazy, huh?! I honestly don't know where the time went and it certainly doesn't feel that it's been that long. 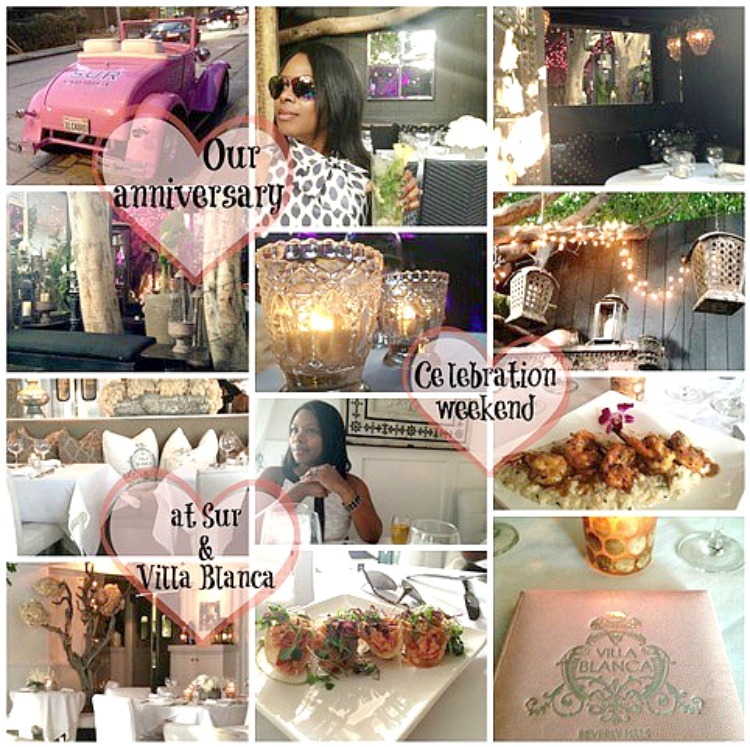 This year, we kept it very low key by just doing what we mostly enjoy best - being in each other's company while enjoying good food, wine, and great ambiance, which we relished in at Sur of West Hollywood and Villa Blanca in Beverly Hills. The most surreal experience though was being served by Pandora at Villa Blanca. She's just as beautiful in person as she is on TV and most importantly, she seemed to be very humble. People are always surprised that we've been married as long as we have and often ask us what's the secret to staying happily married? While it's true there are no perfect marriages, a successful one is the product of hard work based on some fundamental qualities (founded by the originator of marriage - God) that can help a couple have a long lasting, happy marriage despite difficulties. I'll just mention a few core things that have helped strengthen our marriage throughout the years. 1. The ability to have insight. It helps to understand the thoughts and feelings of our mate. Being insightful means to take note of each other's feelings and try to adapt your approach accordingly. Of course, to develop insight involves being quick to listen, slow to speak, slow to give into anger. 2. Grow in love. Falling in love is the easy part - it's always easy to say "I love you," but the hard part is staying in love - through challenges, individual changes. But really true love grows when you experience life together, with its joys and tests. That's when you become even closer as friends and cherish each other's company. Love like that is nourished, not by just a few great deeds, but by countless smaller acts such as, a hug, a kind remark, a thoughtful gesture, a telling smile, a quick text throughout the day 'just to see how things are going' or a sincere "how was your day?" It's actions with these little things that make a big difference in a marriage. 3. Cultivate respect. No matter how in love you are, you still may not see eye to eye with your mate (speaking from experience), but these differences don't have to drive a wedge between you. Love grows out of respect, so having respect for each other helps you to avoid speaking thoughtlessly - using thoughtless words in an unloving tone to each other. 5. Good communication. Never let one day pass by without communicating with your mate. Frequent and meaningful communication is key. It's been said that communication is the lifeline of a marriage, because it enriches the marriage for it draws you closer to each other. So it's important to learn to convey thoughts and feelings to each other honestly. 6. Humor. In our case not taking things too seriously has helped lighten some tense moments in our relationship. We make each laugh all the time. Laughter cures all ills and any ill-feelings at that. I can't say that I've honed these aforementioned qualities to a 'T' as there's always room for improvement. However, having applied these different qualities when necessary in our marriage has helped us to overcome difficult moments and strengthened our marriage bond and love for each other. A successful marriage is not static but grows richer and stronger with time. Thankfully, I have an easy going hubby that has been there for me through the good, the bad and the ugly times. As the years swiftly pass by, our love for each other only grows stronger and I pray we grow old together like the couple portrayed in the movie: The Notebook - remember the ending? A must-see-movie for sure.